Wednesday, 30 January 2019, 7:07a.m. 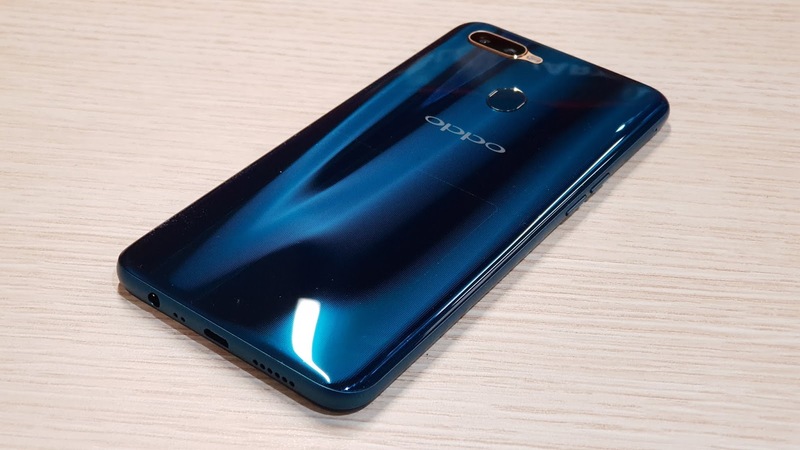 From not even selling phones in New Zealand just a couple of years ago, OPPO now seems to be releasing a new handset every 5 minutes. As you can see from the picture above, there's absolutely nothing "budget" about the way the OPPO AX7 looks. Available in Glaze Blue and the slightly unfortunately named, Glaring Gold, OPPO describes the finish as a "sheet and grating" pattern. I have no idea what that means, other than it gives it an almost woodgrain-like appearance from certain angles. It's pretty cool, anyway. For some reason, there's an unusual copper/gold surround to the rear-facing dual lens camera and flash module. It's unusual, but quite classy. The handset has a premium feel to it all round. The AX7 is certainly at the larger end of the scale - mostly because of its 6.2inch screen size. I was surprised to discover the screen-to-body ratio is as low as 88.4% - really, it seems like the front of the phone is all screen - especially when you take into account the very small waterdrop notch for the forward-facing camera. These tiny not-notches started appearing on some flagship devices at the end of last year and is a clear sign the short-lived days of the much more intrusive iPhone-style notch are pretty much over. The advantage of a massive phone, other than heaps of display real estate for browsing, streaming and gaming, is you can bung an equally massive battery inside. The AX7 sports a 4230mAh battery. This is actually more battery than I know what to do with. As you can imagine, I'm a moderately heavy user of my devices, especially given I get up at 3AM to go to work. That's a lot to expect from a smartphone battery and yet by the time I get to bed, most days I've struggled to get through one third of the available charge. Very impressive. Unfortunately, as we've seen with previous OPPO devices, part of the reason they can achieve such incredible power savings is due to some overly-aggressive software optimisation. OPPO isn't the only manufacturer out there guilty of turning off too many background apps without asking, but that doesn't mean it's necessary. Annoyingly, even when you manage to find the magic setting that tells the AX7 not to turn a particular app off, a lot of the time, it still does. Most frustratingly of all, the AX7 still uses a microUSB charging cable instead of the much more user-friendly USB Type-C. Now that other phones in this price range have switched, it's time OPPO did too. Back on the plus side, the AX7 packs in a surprising amount of processing power for a $399 phone. You get a Qualcomm Snapdragon 450 chip, 4GB of RAM and 64GB of on-board storage. These are by no means high-end specs by 2019 standards, but those numbers are still plenty impressive for the price. What's more, you get a dual-sim tray as well as a microSD compartment to expand your memory. Certainly I found the AX7's performance to be very smooth and reasonably quick. I'm not a huge fan of the ColorOS 5.2 interface, but it's based on the very recent Android 8.1 O.S. and I didn't come across any major glitches or problems. Ultimately, any OPPO phone lives or dies by its camera quality and once again, the AX7 stacks up pretty well. While the full range of A.I. settings offered by more expensive devices aren't included here, I found images from both front and rear cameras to be very clear and crisp. Colours tended towards the dull side, but that's preferable to the unrealistic over-saturation you often find on other phones. There is some A.I. built into the beauty settings - and this comes into play not just with the 16MP selfie cam, but also when you set the dual-lens rear camera to Portrait Mode. The split focus bokeh effect for both these options is pretty full-on, but I have to admit, it looks great more often than not. There are a couple of cute tricks thrown in too; plenty of AR stickers to make your pics look as silly as possible and a very efficient face unlock which works reliably and quickly - even in the dark. At $399, the AX7 definitely delivers. It looks great, feels solid, has better-than-average camera capabilities but most significantly, if you're looking for incredible battery life, there aren't many other phones out there as long-lasting as this one. Click here for more information on the OPPO AX7.